As a general rule, I review things that grab me in one of two ways. Either the product is so good that I need to tell the world, or the product or service is so bad that I need to tell the world. I also sometimes do reviews by request, but so far that’s been a rarity. To cut to the chase, WCR pickups are so good, I felt the need to tell the world. 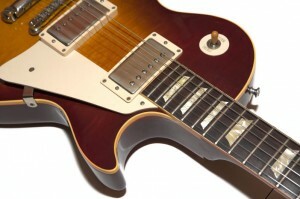 I first discovered WCR pickups when I bought a used 1959 Reissue (R9) Les Paul from The Gear Page (TGP) forums. This stunning guitar came with a set of WCR Goodwood pickups. I had read about WCR, but never thought I would pay $300 for a what amounts to magnets and some wire. Boy was I wrong. The Les Paul was beautiful, with an amazing one-piece top. 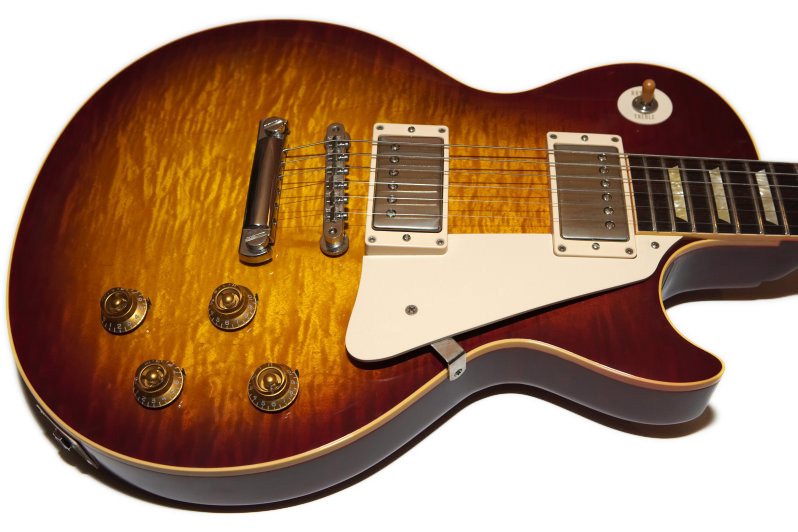 I’d never owned a Les Paul in my 30 years of playing guitar, and decided that if I was going to buy one, I would buy a good one. I’d never seen such a pretty guitar, and it’s weight and playability were second to none. Looks and playability are one thing though. The real surprise came when I plugged it in. When I plugged this guitar in and strummed a chord, my jaw hit the floor. The amp I used was a Peavey JSX 2×12 combo, which isn’t an amp that gains a lot of respect from the boutique guys, but I’ve always been impressed by the surprisingly good clean tone from it. I goose it with a mix of boutique and hand-made pedals to get the tones I like and it has worked pretty well for me. I happened to have had the amp set to some nice dirt tones, and when I hit that first chord I was floored. The guitar sounded unlike anything I’d ever played. Certainly part of this was the guitar itself, but there was something else going on here. The guitar had RS Electronics pots and caps in it, which helped the tone a great deal. The pickups were WCR Goodwoods, and the best way I could describe the tone was Oh… My… God. The WCR pickups had something I’d never experienced from any other pickup: power AND articulation. With a nice dose of AC/DC-level distortion, the guitar sounded so powerful that it frightened children the next town over. Power is one thing, but even with the perfect grind, I could hear every single note in the chord. Wow! The muddiness that I had taken for granted for years was gone. The nerd in me wondered how such a thing was possible. The guitar player in me just played and smiled. For the first time I swore that I could hear the wood. What a sound! Next I turned up the gain a bit, flipped over to the neck pickup and played the opening riff from Still Got the Blues for You. The woody sound and overtones from Gary Moore’s real ’59 were there. They were there! I was giggling like a little girl as I twiddled knobs and played more stuff. Van Halen’s Panama was next. The clarity really helped improve the tone, but the Peavey just couldn’t nail that brown sound. This was the closest I’d ever come to it, but Van Halen is no fun without a Floyd Rose, so I moved on. I spent hours playing that night, and it was as if I’d finally played a real guitar. A year or so later, life got in the way and I was forced to sell that R9, but I refused to sell the Goodwood pickups. They’ve since been in a 1958 Reissue (R8) which I also later sold, but the WCR Goodwoods stay with me. I’ll never sell them. Right now they’re sitting in my safe waiting for another guitar. They belong in a Les Paul – I just need to find one that’s worthy of them. Jim Wagner, chief pickup designer, head winder, owner and all around great guy is the brains behind the WCR pickups. I have no idea what he does to make them so special, but he swears it’s just the right winding formula and consistency. It wouldn’t surprise me if he’s winding unicorn hair or meteorite shavings in them. Regardless of the ingredients, Jim knows what he’s doing, and he knows what you want. He’s very friendly, very happy, and will always help you decide which of his stellar pickups you need. He’s got some pretty big stars as customers, and he hangs out with some of the biggest names in rock ‘n roll. I’ll be honest, I envy his life a little bit. A year or so after I bought that R9, I decided to replace the pickups in my Jackson Soloist. My Soloist was a Sam Ash special edition with an arched top and a rosewood board. It was made in Japan, but had the same Seymour Duncan pickups as the US-made Soloist. They never really did it for me, so I asked what he would recommend for killer high-power rock in a shredder-type guitar. He recommended his Ironman set. 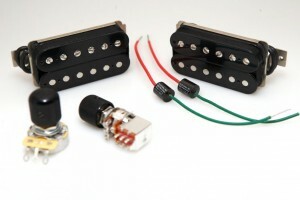 These monsters are regular passive pickups that have an impedance of 22K. That’s active pickup territory! I said sure, placed the order, and had them in short order. One of the things that I really dislike about modern Seymour Duncan pickups is the big white Seymour Duncan emblazoned on the bobbins. I detest branding like this, and it’s driven me more than once to pull a set in favor of other brands that don’t do it. As you can see, WCRs are noticeably and thankfully devoid of any such obnoxious display. The Ironmans were indeed powerful. They screamed into the JSX, but I suspect where they would really shine is direct into a low powered boutique or vintage amp where the guitar itself could overdrive the amp. They were more powerful than the Goodwoods, but to my ears they lacked the articulation of the lower-powered PAF-like ‘buckers. To my ears the Ironmans were great for solo work, but not as great for rhythm stuff. With high-gain lead, either the neck or bridge pickup sounded wonderful with killer sustain and great tone. Make no mistake, these pickups still have substantially more articulation than either of the stock Seymour Duncan pickups. I’d simple been spoiled by the Goodwoods. I should note after gushing about the Goodwoods that Jim no longer makes them. He’s taken them, improved upon them in ways I can’t claim to understand and now calls them Godwoods. I have no idea what the differences are, and Jim will only say that “They have more of everything”, whatever that means. I’ve always sort of wondered how he could possibly have improved on the sonic perfection that is the Goodwood, but he swears that he has. I would soon hear for myself. 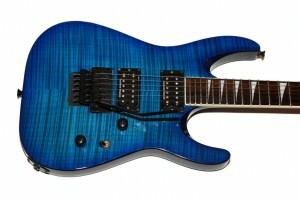 I recently decided to upgrade my USA Jackson Soloist SL2H and once again asked Jim what he recommended. I told him I wanted that articulation, and delicious crunch that I got from the Goodwoods, but that I was playing more and more Van Halen as well. Finally I told him that I would be putting these pickups into a USA Jackson. Jim guided me to his American Steele set. This set is comprised of a Godwood pickup in the bridge and a Crossroads in the neck and was inspired by Anthony Steele. Apparently the set is also favored by Keith Nelson and Stevie D of Buckcherry. The Crossroads pickup is supposed to nail the sound from the song Crossroads on Cream’s Wheels of Fire album. I like Cream, and I like Buckcherry, but I would have never guess they had anything in common. Still, I trust Jim’s judgment, and love his pickups, so I whipped out my debit card. Seeing as how this set was going into a Floyd Rose equipped super-Strat, I asked about F-spacing. That made sense to me, even if I didn’t know what a polymer field finder was, but I trust Jim, so I stopped worrying about it. Sure I like things to line up, but I’ll pick performance over looks every time, and Jim’s pickups are so good I’d buy them if they only came in hot pink with daisies and unicorn stickers on them. Well, maybe not unicorns, just so long as he didn’t print his name all over the bobbins. I ordered a set of American Steeles and added some electronics including a push-pull pot. I installed the pickups and electronics with only slight issues, none of which having anything to do with the pickups or components. Once they were in I plugged in and was once more blown away by the power and articulation of Jim’s winds. Are the Godwoods better than the Goodwoods? I don’t know. I don’t have the time nor patience to A/B them in the same guitar. I will tell you that the Godwood in the bridge of my USA Jackson SL2H produces the same jaw-dropping experience I first felt with the Goodwood in my Les Paul R9. They were awesomely powerful, yet when the volume was rolled down, they were deliciously sweet. Jim describes the Godwoods as, “Renowned for their ability to either sing a baby to sleep, or blow the balls off a charging rhino at 100 yards.” As much as that reads like hyperbole, I would have to agree, though to be fair, I’ve never even seen a rhino, let alone tried to stop one from charging with my guitar. The Crossroads in the neck position was a great choice. To my ears this pickup is a little… thicker sounding than the Goodwood, but to be fair, I heard them in very different guitars. All I can tell you is that once again, his recommendations were spot on. I could not be happier with these pickups. There are a lot of boutique pickup winders out there these days. It’s a great time to be a guitar player. Back in the 70s we just played what was in the guitars we bought. Now there are hundreds of ways to spend your money on improving your guitar. WCR pickups aren’t for the budget minded as they all hover around $300 a pair, but for my money, WCR makes the best damn humbuckers out there. I stumbled onto your blog from Google while researching WCR pickups for my R9. I thoroughly enjoyed the read and appreciated your explanations. Kudos to a fellow “Jersey Boy”. Had the Filmores, the first set he started selling. They came in an ES335. Having heard them I thought they’re ok but they’re certainly not worth $400. I sold that guitar with them in it without a second thought. Lindy Fralin PAFs are better by a long shot. I have uses the Goodwoods. I used Goodwoods in one of my PRS McCarty models and. les Paul. They were nice, but didn’t find them any better than most other pickups. Lots of hype with pickups. Stick to the standards. I have to completely disagree with Rich. I have a godwood installed in my 1976 fender strat and it is, hands down, the most amazing pickup ever made. I don’t think I’ll ever switch away from WCR pickups now. My godwood cost me about 200 dollars all in, and it is the best 200 bucks I have ever spent in my extensive guitar playing career. I understand Rich may have a had just an ok experience – but I was absolutely blown away – and I recommend WCR pickups to every guitar player I know now. Some stick with Seymour duncans, some prefer di marzios – but I’m now officially a WCR guy…cannot recommed them highly enough…. I just installed the Godwood in the bridge position of my Les Paul Standard and wow this thing rocks. Thick and juicy tone that cleans up nicely without the boomy blurry flub at low guitar volume settings. I’ve been playing out and tone chasing for 40 years and have tried all kinds of gear and pickups so I know a little about tone and I am very picky. This is hands down the best pickup I have ever heard. Just Fantastic!!!!! Money well spent. Highly recommend you give them a try. I put a Darkburst in the bridge and a Crossroads in the neck of my ’88 Ibanez JEM. Absolutely freaking fantastic. It’s like you said, I can hear every note cleanly and clearly in chords. The Darkburst works well obtaining the famous “brown sound” and cleans up nicely with the volume knob, without losing clarity. I went with the Darkburst over the Godwood in the bridge mainly because I wanted to closely match the Crossroads in the neck. Where the Crossroads are pretty much a classic PAF, the Darkbursts are only slightly over wound. I have had two different sets of DiMarzio’s and two different sets of Duncans’, and one set of Bartolini’s in my JEM and none of those could come close to matching the sheer musicality of the Jim Wagner pickups. I can not see myself ever buying anything other than Jim’s pickups. They are definitely something special. Maybe they are wired with unicorn hair and pieces of meteorites as you suggest. Yes, tell the world! Well, this thread along with a ton of others I have read, all STELLAR reviews, as well as the few YouTube videos I could fine that are worth a crap (any YouTube video or sound clip that is primarily distortion isn’t worth CRAP for evaluating a pickup), I have ordered Jim’s American Steel set. We shall see if my jaw hits the floor when I put them in my guitar! Yes,so many variables to consider in yt videos that it’s crazy to compare. I also hate Duncan’s white logo on the bobbin but in Canada,it’s the easiest after market pickup we can buy. Duncan makes good stuff,and his website is the best,imho. I’m sure there are better pickups but Duncan do it very well. WCRs website is a joke by comparison.It is up to little guys to get their brand out there…this is almost convincing but again,so many variables and a website like WCRS from Day 1 of internet commerce is not convincing or helpful. Jim’s website is, indeed, a bit dated and can be tough to navigate, but he is one guy who literally does it all from winding the pickups by hand to packing them up and bringing them to be shipped. His pickups are so good that I cut him some slack for everything else. There are a fair number of pro musicians who love his stuff and that happens because of word of mouth, not because of his website.